The movement group for separate Bodoland, ABSU, NDFB (P) and PJACBM once again resumes its democratic mass movement through the Mass Gathering at Rowta, Udalguri on Saturday, the 3rd June 2017. In this gathering the movement leaders and announced a series of agitational progrmmes including 2 hours black out from 6 to 8 PM on 12 June, National Seminar in the month of July at Constitution Club, Economic Blockade in September 2017 Etc. talking to arunachal24, the ABSU president Promod Boro said that the agitational programme to be continue until the government resolves the issue for once and all. It must be mention here that In response to the letter issued by the Government of India inviting the ABSU, Joint Action Committee for Bodoland Movement and the NDFB (P) for the Political Level Tripartite talk to be held on the 25th April, 2017, in New Delhi, the Joint movement group has temporarily suspended the 24hr proposed Bodoland Bandh called on 25th April 2017 and other movement programmes in order to create a conducive atmosphere for talk and finding solution to the Bodoland Issue. The Movement group expected a positive response from both the governments through the tripartite talk held in presence of Hon’ ble Union Home Minister Rajnath Singh and CM of Assam Sarbananda Sonowal on 26th April 2017 at Political level after series of democratic mass movement since the NDA government came to power in 2014. The movement group also anticipates a Permanent solution of the long pending Bodo Issue within short period for the interest of sustainable peace and all round development in the region. The joint movement group demand for adopting a clear-cut and pragmatic policy decision from the Government of India during the talk. 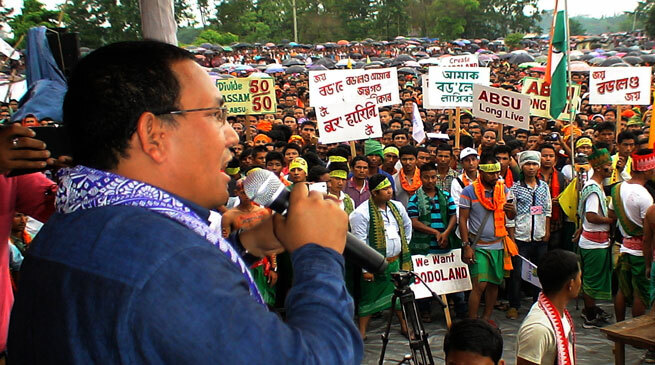 The Bodo Tribal group among is determined to protect their unique identity and culture at any cost and for that the movement has been continuing for last 50 years.